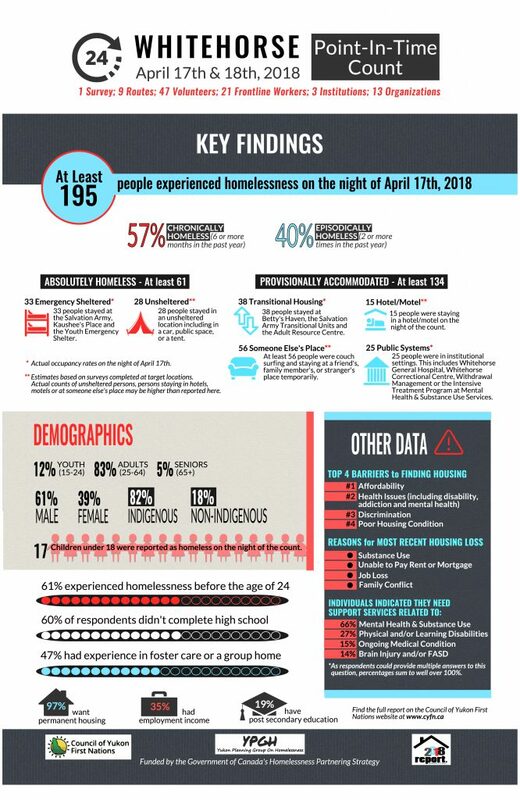 The Council of Yukon First Nations conducted Whitehorse’s second Point-in-Time (PiT) Homeless Count in April 2018 in association with the Yukon Planning Group on Homelessness and the Homelessness Partnering Strategy. The city’s first PiT Count took place in April 2016. The PiT count is part of a national initiative, the Government of Canada’s Homelessness Partnering Strategy, funded by the Employment and Social Development of Canada. The PiT Count provides a “snapshot” of homelessness in Whitehorse, Yukon. The results of the PiT Count can be used to improve responses to homelessness in the territory. Please see the full report here 2018 Report-Whitehorse Point in Time Count.